Obesity is one of the defining health challenges of our generation. Studies project that, if current trends continue, more than 50% of the US population will have obesity within the next 20 years. Alarmingly, severe obesity appears to be increasing in prevalence faster than overweight or "routine" obesity. Illness associated with obesity, such as diabetes, cardiovascular disease, steatohepatitis and sleep apnea, is experiencing a commensurate increase in prevalence and severity. The obesity health crisis threatens to overwhelm our health care system, shorten life expectancy for the first time in recorded history, and reduce quality of life for millions. 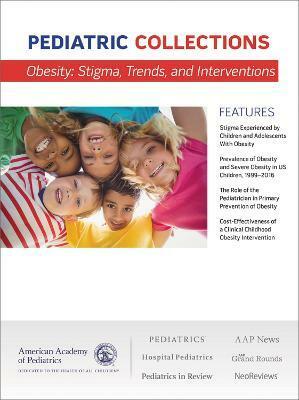 The most successful and cost-effective approaches to this epidemic involve the prevention and treatment of pediatric obesity. Additionally, obesity is affected by a myriad of factors, including individual genetics, personal behaviors, family habits, school and community programs, state and federal policy, and environmental factors. Obesity is one of the most complicated disease processes pediatricians deal with. It is a disease that is brought about by a myriad of causes and a disease that affects nearly every organ system in the body. This collection will give you easy access to topics that help you manage this challenging disease. "Better information on focused subject matter." Jeanie Prince, MD, FAAP "Pediatric Collections are helpful and informative; they have added to my understanding specific subject matter and facilitate advocacy involvement." Roberet W. Sprunk, MD, FAAP "Concise and up to date relevant information on topics of interest. Pediatric Collection provide helpful talking points and advocacy ideas."